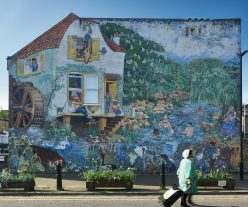 For an insightful guided tour of the origins of the Brixton murals join Ruth Miller, founder of the London Mural Preservation Society. She will also explore the murals ongoing conservation, restoration and legacy. Mexican-born and New York-based artist Aliza Nisenbaum will discuss her practice and its relevance to the current political climate in the United States with Oliver Basciano, International Editor for ArtReview. This event relates to Nisenbaum’s first UK public commission by Art on the Underground, opening on 10 April until September 2019 and Contemporary Art Society’s acquisition of a major new painting by Nisenbaum for Norwich Castle Museum & Art Gallery in 2018. Influenced by the Mexican mural movement and its depiction of social history, Nisenbaum’s work probes the politics of representation by bringing together often-marginalized or overlooked groups of people to the fore in exquisitely painted portraits. She has continued this practice for her new commission where she was artist-in-residence, living and working in Brixton from 15 December 2018 until 27 February 2019. Through an open call, Nisenbaum then selected 15 members from Transport for London staff from Brixton station and the Victoria line – from train drivers, customer service staff, cleaners – who, over several hours, were individually painted in her studio to create a large-scale group portrait specifically for the entrance of Brixton Underground station. Through her artistic process, Nisenbaum seeks to transform the traditional artist-sitter relationship by creating works which challenge the hierarchies of portraiture. 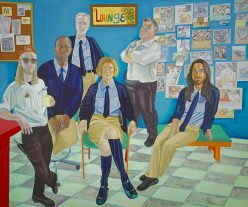 For her, the process of painting portraits from live sittings is a reciprocal act, one that sets up an ethical encounter in which both participants give their attention and trust, and learn about one another. Nisenbaum is the second commission in a new series at Brixton, following ‘Remain, Thriving’, 2018, a new site specific work from Njideka Akunyili Crosby. 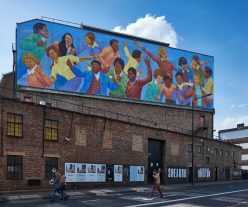 The programme selects artists to respond to the diverse narratives of the murals from the 1980s, the rapid development of the area and the wider social and political history of mural making. Tour starts at the entrance of Brixton library. Join us for a free family tour of some of the Brixton murals led by Art on the Underground’s Engagement Project Manager Rachel Moss. 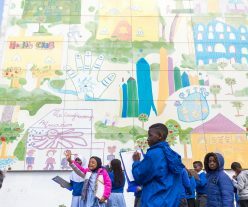 Hear stories about the murals, take part in drawing activities and play games to learn more about the history of Brixton. Free sketchbooks provided. No booking is required for the family tour. All ages welcome. Children must be accompanied by an adult. Please note if it rains the tour will still go ahead as some of the murals are undercover. Come and listen to local historian and Blue Badge Guide Kelly Foster as she explores the memorialisation and portraiture in Brixton’s public art. From familiar sculptures to the lost murals she’ll look at who has been commemorated on the streets of Brixton and the artists that created them. 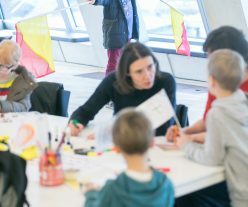 Join us for a free family art workshop inspired by the giant artwork by artist Linder that wraps the Southwark tube station building. Explore Linder’s artwork using our family trail. Handle objects from the Cuming Collection with Curator Judy Aitkin. 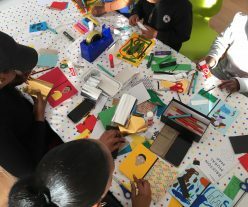 Create a 3D collage that connects Southwark’s past with the present day with artist Meera Chauda. No booking required. All ages welcome. Children must be accompanied by an adult. Linder’s commission The Bower of Bliss is on view at Southwark tube station until October 2019. This event will premier Televox: A musical composition built from messages sent between people living and working along the new Northern line extension: Battersea – Nine Elms – Kennington. Drawing inspiration from a range of communication methods from the telegram to musical telegraphy, artist Emma Smith proposes new ways in which neighbours and strangers might communicate. 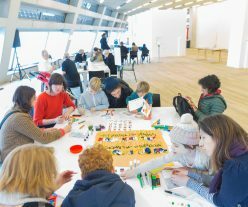 Join the artist, invited speakers and musicians in a series of workshops at Tate Exchange. Communications Department forms part of Emma Smith’s new project Televox.